With this backdrop, Eventful Conferences spoke to 50-plus retail, consumer products, and wholesale distribution companies in an attempt to unpack and understand their world. Are they being challenged with a high degree of change? Is their world becoming increasingly complex? If so, how are they responding? From the outset, retail, consumer products, and wholesale distribution companies have talked very openly about the big forces, those macro challenges confronting their industry and driving the decisions of their executive teams. Customization: Consumers are often looking for unique products or experiences. Speed: Consumer trends are emerging and moving quicker than ever. Scale: Companies are needing to replicate, scale, and globalize in a highly efficient manner that is massively complex. How are companies dealing with these competing forces, and what solutions are they coming up with as they pursue the delivery of a superior customer experience? In order to see how things are playing out, we wanted to directly observe these companies’ customers, so we spent a Saturday in SoHo, New York City—a global retail epicenter—wandering and observing consumers in action. Of all the amazing stores and customer experiences, the one that stood out more than any other was the Nike store. In the middle of the ground floor, there’s a shoe customization section. 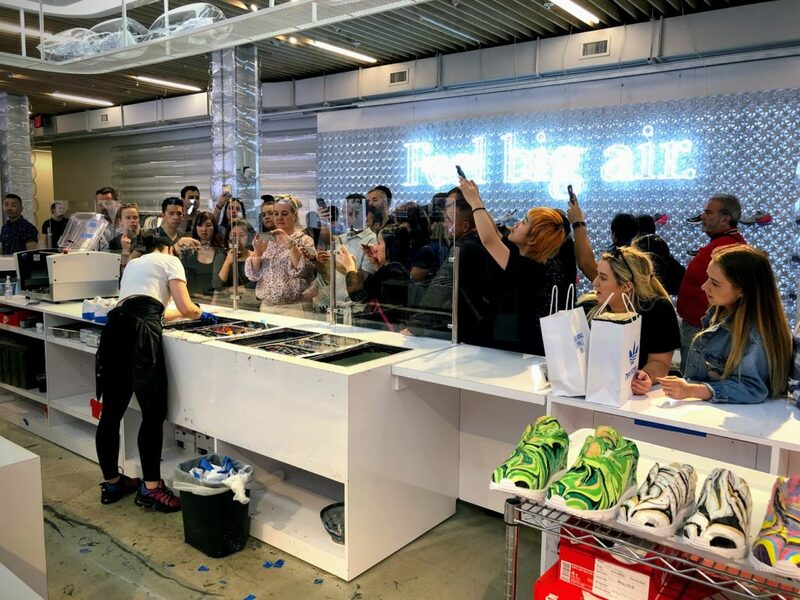 A customer can choose one of Nike’s latest model shoes, such as the Air Max 270, choose five colors, and watch their custom shoe get created, along with a crowd taking photos and posting them. Nike has invented a process to create truly unique shoes, simplifying the process by starting with one color—white—creating a pair of custom shoes in minutes, and getting free promotion from other consumers posting and sharing images. While Nike has been customizing shoes online for some time, seeing and experiencing the process and customer reactions in store is incredibly valuable. Nike has harnessed its capabilities to deal with the competing forces of customization, speed, and scale; plus, it’s using the in-store experience to demonstrate how innovative the brand really is. The store was packed with locals and tourists, and the creation of every shoe was an event. People were captivated by the cool technology, and they shared the experience instantly through photos and videos. Genius! Creating a digitally enabled customer experience: How do companies harness technology and develop a mobile-first, omnichannel customer experience? Developing a digital roadmap: As an SAP customer, how does the company integrate and optimize the full potential of the SAP suite and extensions from partners? How does it make the right decisions today for tomorrow? Integrated supply chain and inventory management: How does it anticipate demand, align inventory, and maximize sales? Predicting and forecasting sales is tough and getting tougher. Big data and analytics: How does it get the right data to the right people, in the right form, and at the right time to help the company make better decisions? Data, cybersecurity, and IT protection: How does it protect customer data from a breach that could seriously impact the trust it has worked so hard to build? This topic is especially front of mind given recent data breaches and consumers reacting to the use of Facebook data. Technology innovations: With advancements in blockchain, Internet of Things (IoT), robotics, artificial intelligence, machine learning, and augmented reality, which new technologies will have the biggest positive impact on a business? There has also been another underlying theme that we’ve seen emerge in other industries, particularly in the past 12 months. Historically, companies have looked at their traditional competitors and been reticent to share expertise or experience for fear of losing competitive advantage. This is no longer the case. Established companies are realizing that future competitors may be tomorrow’s disruptors. Therefore, there’s real value in collaborating with each other around core business process optimization. In other words, if a business process is not a source of competitive advantage, then collaborate, define, lock down, and bake in a cloud-based application. This approach is enabling established market players to move quicker together and mitigate the risk of being disrupted by more-agile market entrants. We are finding companies in the retail, consumer products, and wholesale distribution industries expressing a real desire to come together, share, and learn from each other. There is no doubt that companies in the retail, consumer products and wholesale distribution industries are experiencing disruption and are needing to drive transformational change. At Eventful we’re excited and committed to play a role in helping companies navigate the complexity of this change. Download the complete research report below for a comprehensive look at the industry trends and topics that emerged. These topics will be the framework for the content presented at the 2018 Customer Experience Innovation Forum.